How To Stop Applications From Opening at Startup in Mac OS X Mountain Lion? You are here: Home / Apple / How To Stop Applications From Opening at Startup in Mac OS X Mountain Lion? Whenever I load Mountain Lion some applications like utorrent, Mail, Entourage, and ICal open on my desktop at startup. Each and every time I need to close these applications. This is annoying me. Is there any way to FIX this issue? Yes, there are two solutions to fix this issue. In Mac OS X Lion 10.7.4, uncheck the checkbox “Reopen windows when logging back in” when you Log off / Shutting down / Restarting the OS. This will fix the issue. 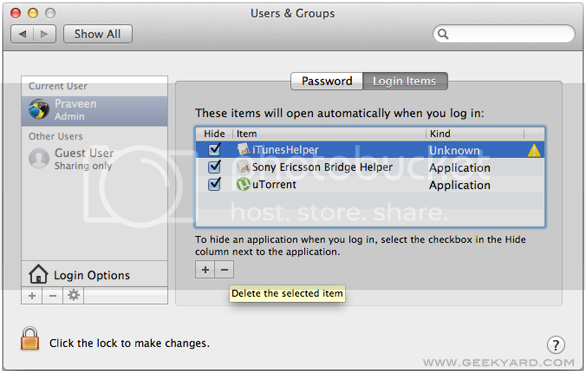 Goto System Preferences –> Users & Group. Remove the apps that you don’t want to load at startup.